Sophisticated, masculine style, by Hamilton. This men's brown leather strap watch features a bold round dial, with a slim stainless steel bezel and rose gold sub dials, hands and hour markers. This attractive timepiece is perfect for evening wear. 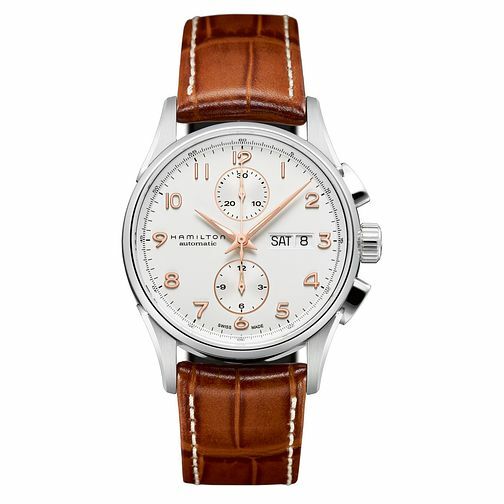 Hamilton men's brown leather strap watch is rated 4.8 out of 5 by 4. Rated 4 out of 5 by Anonymous from Nice Watch This is nice looking watch for both business and casual wear. The watch has a good size face but the depth for me is too much at least 15mm which means it sits prod of your wrist. Feels a good quality and well made watch, not sure about the quality of the strap, showing wear and tear very early in use. Rated 5 out of 5 by Anonymous from Chronograph that can be worn as a dress watch Exceptional quality for the price, very classy looking with good quality rose gold hands and markers, complemented with a good leather strap. Also has a sapphire crystal back where you can see quite nice detail of the movement. A good purchase at this price point !